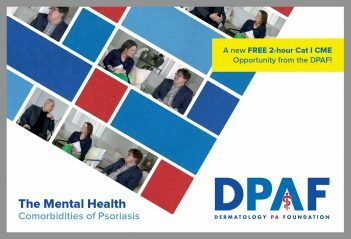 The Mental Health Comorbidities of Psoriasis is a special complimentary course brought to you by The DPAF. Join Dr. Richard Fried, Bethany Grubb, MPAS, PA-C, and Dr. Jeffrey Weinberg for this unique learning experience with a more conversational tone between these three industry experts outside of a conference setting. This course will be available until April 1, 2020. After completing this course participants will have increased knowledge of how to recognize, identify and assess mental health cormorbidities in psoriatic patients, screening tools, an appropriate plan of action, and more. Learners will earn 2 AAPA Category I CME credits for completion of this course. Participants will watch two 1-hour discussions (Part 1 and Part 2) between our faculty, each followed by a course exam. This course is made available through the SDPA Online Learning Center for easy access by both SDPA members and non-members. To get started, simply log onto the SDPA Learning Center by clicking the button below and search for the course under the “Course Catalog” tab. If you are not an SDPA member and do not wish to join, contact the SDPA at admin@dermpa.org first to set up an SDPA Learning Center profile. Once that profile is set up, you can logon and complete your course as well as purchase or take other SDPA courses. The DPAF will be working to provide education courses each year, so stay tuned.